Nearly Newlywed - Buy, Sell or Rent a Wedding Dress Business has as a new twist on getting Married that can save (and make) you a lot of money. The owner and inventor of Nearly Newlywed Jackie Courtney came up with an idea that I wish was around several years ago :). Getting married is expensive enough and spending a significant amount of your budget usually involves the wedding dress. Yes, I get it, (or already got it) This is Your Day, a day you will treasure for the rest of your life. You want the ultimate wedding dress you will keep for the rest of your life. Really? Now let's be honest here. How many times have you worn your wedding dress since you were married? How Many? Yep, that's what I thought. It's easy seeing this is a huge virtually untapped market mostly from the built in conception that you "need to buy your wedding dress". Why? I'm not exactly sure where this came from, but the manufacturers would probably like to see it stay that way. A product you only buy (hopefully) once, but everyone that gets married buys a brand new. I didn't have any problem returning a tuxedo, why should renting a wedding dress be any different? By borrowing your wedding dress, you can upgrade to the likes of Vera Wang or the Marchesa Collection without breaking the budget. You're only going to wear it once, so why not get the very best possible for around the same price of a less appealing dress. If you really like the wedding dress you can still keep it or sell it back to Nearly Newlywed and use that extra money on your Honeymoon. 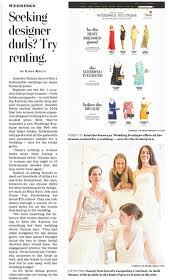 Nearly Newlywed is also expanding in buying and renting gently worn high-end party dresses to add to their collection. The same concept applies here but with a much broader appeal for using the service multiple times. IMO this should almost be another division of the company with its own website, but still interconnecting the two. The process of renting your Dress to Nearly Newlywed is what sets this company apart. You simply send a photo with a detailed description of how used it is. If it is accepted into the Nearly Newlywed Collection, it will be posted on the website for an agreed amount. If a lucky Bride decides She wants to rent your dress, you will be paid on a 65/35 split with the 65% going to you. There are no upfront fees and you never pay Nearly Newlywed a dime throughout the process. If you would like to sell your dress Thur the network, you will be paid on an 80/20 split with 80% of the sale price going to you. These numbers seem very fair for all parties involved. According to the website, they will be getting into Accessories real soon which should add to the overall Brand. This looks like a promising future for Nearly Newlywed but will the Sharks be interested in this niche market? Does Jackie Courtney have a big enough share of the market to warrant a large investment? Or will Kevin O'Leary give his speech (again) on why can't he just start Mr. Wonderful's gently worn wedding dresses? Tune in this Friday Night on ABC when Courtney makes that long walk into the Shark Tank Show. This sounds like a real good idea. I hope Jackie takes this idea and makes it BIG!!! Even though the investors wouldn't dare buy a used business jet for their next meeting, this is the kind of thinking the rest of us non-billionaire citizens need. Hope it takes off faster than a shark's jet. It is really good information to share about the Nearly Newlywed Wedding Dress. This information will be useful for the engaged girls. The engaged people may use the wedding planner iPhone app for finding the dream wedding dress. I am so glad that she did not take the deal! She can do this all of her own. It is a great idea and business! I personally think every bride deserves to keep her dress after she marries, and if she can afford to do so will. Buying a used or even renting a gown that has been worn by someone else is a little creepy, just my opinion. There are lots of boutiques that sell new/unworn samples at very low prices, just shop around.